Racism and racial discrimination doesn't seem to exist in Tenerife North Spain. The crowning as carnival queen 2009 of the lovely black teenager Ana Maria Tavarez on Wednesday 18th of February made News Spain. The young lady Ana Maria Tavarez is actually only black in American terms like President Barrack Obama who is not African either. The Spanish expression Morena or colored like in South Africa which is not exactly the same like moreno or morena doesn't seem to exist in Spain nor in USA. However, this election was no carnival sensation. Who would dare racist remarks during carnival anyway? The election of Miss Tavarez who has a rather sun tanned looking complexion may have come as a surprise to some, as it was the first time that somebody who is not of 100 % Spanish origin was crowned Reina del Carnaval 2009 (carnival queen) in the Canary Islands. Her stunning carnival designer dress drew much more attention than her slightly different physical looks. Mermaids, snakes and dragons made up most of the decor following the 2009 carnival theme of scary movies and horror films. Racism and discriminating by lower wages wouldn't be a general issue in Tenerife's job market. Tinerfenos (Tenerife natives) with small companies or shops employ few people. By law they must employ one local native first. Indian family shops may have all people working there listed as directors, partners or else. Cheap bistros will employ an African who can prove some experience in gastronomy. But, that's rare. Bistros pay low wages without contracts, very often, especially in todays' recession where travel package deals are a threat for Tenerife restaurants. Take into consideration the general unemployment rate of early 2009 of 97328 in the capital and 117672 in the rest of Tenerife... The total is more than the inhabitants of the capital. Racism is irrelevant with such figures. I've never seen a person with an African face working in Tenerife supermarkets or department stores. 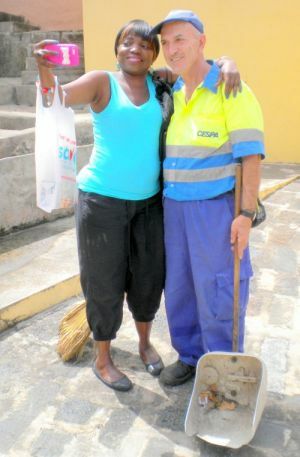 An African from West Africa I once met is sometimes called upon for odd jobs in Puerto de la Cruz and in Los Realejos. He also worked for my friend Lourdes from Bolivia. He lives in La Vera near Alcampo. People wouldn't even think to offer him less money because of his skin color, says Lourdes. However, native Tinerfenos would always employ somebody from the circle of family or friends, though. Number of Africans in Tenerife? It seems to be impossible to find any statistic of African residents published. From what I can see I wouldn't think that more than 1% of Africans live legally in Tenerife. Racism and racial discrimination must be a criteria at Tenerife airports, indirectly. The moment an African country has Islam as only one of its religions employing anybody from such a country would be an unacceptable risk. The threat of Al Caida doesn't allow to take chances, as Alcaida often managed to enter Islam religions in Northern Africa. It must be noticed in this context that Bin Laden the leader of Al Caida was killed by an American military campain at the beginning of April of 2011. You see picturesque African women in tribal gear platting the hair of young tourists on San Telmo beach front Puerto de la Cruz. Most of their clients are Spanish tourists who surely have no feelings of racism. Don't try and take pictures of Africans. They will not take kindly to it. When they have a business license and you pay for the photo the situation will look different. Most African men roam the Puerto hub or try to sell in the capital Santa Cruz. They offer wooden sculptures, copies of designer handbags, sunglasses, watches and whatever glitters. Some of them must have been around since the seventies. You will certainly see them by Playa de las Americas and Los Christianos as well. I am inclined to think, they are eyed with little racism. They found a low key niche in Tenerife tourism without racial discrimination. All you hear is: "Look at them, at least they do honest work. They don't hang around and harm somebody!" Please, note, street hawking is illegal... The fine is about Euros 30 which will be for any race. That's what a street hawker told me without being sure about the exact amount. A striking young Senegalese woman in Los Realejos is a beautition by trade. She has regular local Spanish, British and German customers. She also knows professional massage suited for physiotherapy. Nobody, where I live, seems to object to her with any racist observations or racial discrimination. I know. I once followed a conversation Claude, had with her. He is the Frenchman who gave retirement advice for Tenerife. Indians, Chinese or other Asians as well as people who speak little Spanish seem to be self employed which also prevents racial work discrimination. From conversations I had with young Cubans I know they have problems when they don't have any proof of skilled work expertise. Immigration in Santa Cruz de Tenerife receives more applications from South Americans than from any other country, a 40 year old Cuban woman from my suburb told me. She had big problems, also as she wants to bring in her whole family. Best is to have a job offer before immigrating. Control of immigration numbers is more of a reason than racial discrimination in this case. Do Spanish newspapers have race related publishing policy? Spanish newspapers Tenerife seem to avoid the subject of racism. Political correctness, you know... They will praise Daniel Armand Ngom KOME, the black forward, when he scores a goal for CD Tenerife, the national Tenerife football club. They, of course, report about the misery of African illegal immigrants by inadequate boats. This is one fact which stirs up much pity and frustration about world negative aspects where racist feelings seldom seem to surge. Most illegally arriving immigrants are transshipped to the mainland after receiving first aid or hospital treatment and provisional stay. All who are under age receive Spanish ID, eventually, while the situation with the rest remains a problem, as most discarded their passports. Nigerians make me wonder. Nigerian men make a statement with their white robes in Tenerife. They don't really act low key like other Africans you see on the island. This could cause racist upheaval, especially as people wonder how they earn their bread. Many of them speak Spanish well and seem to be much more educated than Africans from other countries. A few years ago, it was reported as a scandal that Spanish women helped Nigerians to get legal immigration papers by marrying them for money. Money laughs, but the women surely wouldn't have done this had they been absolute racists. You also discover African beauties in areas where the white robes are spotted. That's where some night clubs and bars in Puerto de la Cruz are. The clubs are frequented by tourists who detest racism. sometimes came to see the family who rented a flat below mine. She was rather treated like an outcast. Twice, I found her locked out by the family. She was crying in the staircase. She cried so much I could hear it with locked doors. Beginning of 2009 the family disappeared after I saw the girl leaving dressed like a high class model with designer suitcases. Whenever my neighbors or I met somebody of that family inside our house they wouldn't look at us nor greet us which is rude at our age. This lasted a year. Would you blame us if faint ideas of racism came to our mind? I rather sympathized with the girl, though. She had some innocent traits about her. Chinese, Indians and Japanese in Tenerife usually keep to themselves. However they work in many small shops or restaurants on the island, They attend foreign customers but, normally only employ people from their families.. My young Tenerife IT technician has many Asian friends, some of whom are for business. They often come to his shop. I bet, you will notice Indian and other Asian faces and, perhaps, a few of other ethnic groups at la Laguna university. You will also come across a few Peruvian street musicians with South American Indian features in tourist locations. You may feel some vibes of racial discrimination from Spaniards in Tenerife, which are extremely rare. A local bar owner where I live, once said something very negative about Germans blaming all for what happened in past politics and history. People like that are very unfair in my eyes. It's more likely that this particular bar owner envies other nationalities who were successful or who have beautiful houses on the island. It also upset me a couple of times when I looked for work and met racism related reactions. Too many Tinerfenos were treated well when they were guest workers in Germany. Not all have forgotten this, though. You should not encounter any racial discrimination when you want to buy a holiday home in Tenerife, buy commercial property or, when renting Tenerife real estate. Not to squeeze prices too much will help also, of course. Tenerife history doesn't tell the best of stories about racial relations after the conquest of Tenerife by Spain. Guanches were certainly discriminated as, they were no Cristians and were unskilled to work for early Tenerife settlers. Spain and Guanche cultures clashed too much. Times have changed. Guanches of mixed blood who survived with names like Bencomo are hardly worth mentioning. However, their names are respected without racism, nowadays. Future racism in Tenerife and conclusion. Anti racism in Spain is taught in Tenerife schools, I very much assume. It must be as most young people in Tenerife seem to be very anti racists. Seeing other ethnic groups in Tenerife is lovely. It gives an interesting cosmopolitan touch. The only fact which could cause racism in the future are the masses of African refugees which continue to arrive in overloaded boats from the west African coast. Why? Tenerife has a mere 2.034,38 square meters, only. The island will be too small very soon to accommodate any permanent immigrants, of any color, for sure. Also, local Tinerfenos don't like working abroad until really desperate and will therefore not diminish resident numbers. Illegal boat people immigration was at its peak with 32000 Africans who arrived in 2006 when also all foreign newspapers on the Island gave it priority news. Amazing is the fact that 136 arrived on November 18, 2008 right by Los Christianostown and not on a less prominent Tenerife seashore. The influx of people fleeing societies so different from countries in Eruope hasn't stopped and will not do so. However, recession and open European borders will carry some weight. But, recession will not take forever and Europe's doors will open up more within its own continent. It's to be seen if all will result in less or more European racial tensions. There is no point to continue to rub in extreme racism of the past. Japan ignores this. It's only the present and the future which count and not yesterday's snow. A man who is in control of politics and delivers facts related to improving a present and future without racial discrimination may refer to racist happenings in the past, to some extent. From Racism back to Carnival Tenerife 2009, where the witch as theme has been mentioned in the context. The dress of the Carnival Queen 2009 was hinting at the same.